I’ve enjoyed the PS Vita for a couple of weeks now. It’s a fun device, but as John describes in our review, it feels like the last of its kind. Single function devices are no longer relevant and as much as Sony tried, the Vita is still pretty much a dedicated gaming handheld. The company launched an app store for the Vita today, which folds Facebook, Netflix, Twitter, and Flickr apps into the Vita’s ecosystem. With these apps, along with the powerful hardware and 3G connectivity, the $249 Vita could be a good alternative to a traditional tablet. The only thing it’s missing is a proper web browser. The apps work as expected. The Netflix app uses the same interface as the company’s Android and iOS apps. The app does not support streaming via a 3G network, though. Flickr is downright gorgeous on the Vita. 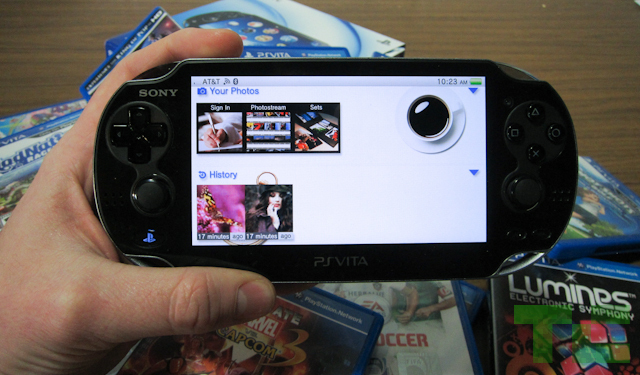 The interface takes full advantage of the Vita’s widescreen OLED screen displaying the image on the left with the details on the right. This app works on 3G. For some reason Facebook is only available to European Vitas. U.S. owners will need to wait a bit longer. These apps finally make the Vita slightly more than just a gaming device. They’re key to the Vita’s success, really. Today’s consumers expect a multifunction device, which, as I can attest, the Vita was not until these apps hit. In fact I was getting a tad bored with the Vita, tending to instead to pick up my iPad for a few minutes of gaming followed by some Facebooking. You see, my gaming attention span is not what it used to be. There was a time when I played Link’s Awakening by flashlight under my bed sheets for hours. Not anymore. I can only handle a few minutes at a time before I get bored and need to move onto something else. I know I cannot be alone. The $249 Vita (or $300 for the 3G version) was a hard sell for me. But now that there are apps, it could potentially fulfill the need of a similar person who wants a gaming device but can’t give up the features of a modern tablet. The Vita already had a Google Maps app, text and voice messaging, and a photo app. If only the Vita had a quality web browser it would be nearly perfect for this demographic. The Vita’s web browser still needs work. It renders web sites like IE 6 (read: poorly). It doesn’t support even Flash 9 and scrolling is painful because of how slow it renders. But it works in a pinch. The Vita is a powerful little thing. It rocks a custom ARM Cortex A9 quad-core CPU, 512MB of RAM, and packs the same amount of connectivity options as an iPad. The 5-inch screen is an OLED capacitive touchscreen and then there’s a massive rear capacitive touchpad for additional controls. There’s dual analog sticks, a directional pad and traditional PlayStation controls. The Vita really is the most impressive gaming device ever made. But even with good launch titles in my opinion it was still missing something: apps. The Vita is launching in a tough market. No other gaming device including Nintendo’s 3DS had to deal with so many competitors. The Vita must combat smartphones, tablets, the 3DS and in the coming weeks, the iPad 3, which will no doubt launch with the force of a mighty backdraft. But Sony seems to know this. The Vita’s hardware and accessories are pricey, hinting that Sony isn’t selling them at a loss. Sony probably knows the Vita won’t outsell the iPad. It doesn’t have to in order to be considered a success. As long as the Vita gets quality games, apps and new features at a steady rate, Sony will continue to make gamers happy. And that’s what it’s all about.